Montreal Canadiens have multi colored stripes in background. Detroit Red Wings with the US flag in the background. Card #s 1-60 feature head shots, and each teams cards appear quite similar? Then additional cards of Toronto (61-79) and Montreal (80-99) feature full body shots. Were these cards released in different series? How come no additional Detroit players were issued? The backs of the cards depict the number, just show basic stats, and are printed in both English and French. Most of the back is devoted to one of three different mail in offers (autographed puck, table hockey game, and Stanley Cup replica trophy). Kids are directed to mail in "ZIP Hockey Gum Wrappers" and a little bit of money to obtain the items. Why are they called ZIP wrappers? Can individual cards be found with different mail in offers? Are any of these mail in offers still out there? What else do I need to know about this set? Right now I'm 56% complete. 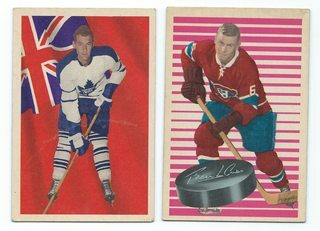 I believe there was an agreement with Topps where they split the teams they would issue cards for, with Parkhurst taking Montreal and Toronto, and often Detroit. This doesn’t seem to have been the same every year but mostly fits. Thanks for the input Scott. Topps co-operating with the competition? Might be a first! The articles I’ve read tend to use wording like “Topps was restricted to issuing cards for Boston, New York, and Chicago”. Sounds like it was maybe mandated by the league the last few years Parkhurst and Topps both made sets.